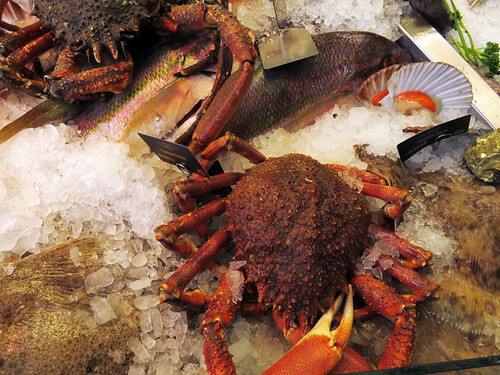 When you’re in the mood for something different here’s a whole wacky world of seafood out there to try! A whole fish on your plate? I think my mom served us whole fish a fair amount – I can’t remember a time when I didn’t know how to cut one apart. 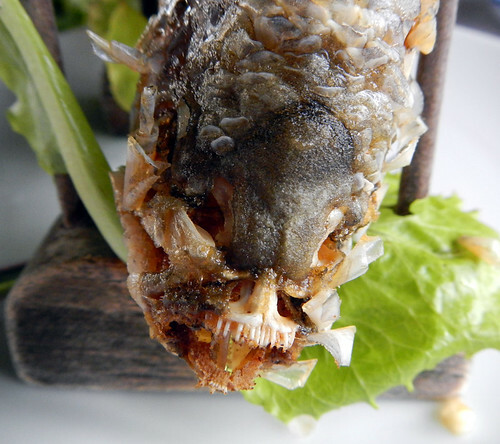 But we were eating dinner with an Englishman in Thailand and he started sawing at the whole fish we had been served, commenting, “You just cut it apart like fish fingers, right?” Umm, no. This fish from Vietnam was a bit more intimidating than the mild-mannered Thai fish he was sawing at, but just as easy to cut apart once you know the trick of it. When was the first time you had raw fish? For me it was sushi back in the 70s and I remember thinking, ‘Well, it’s okay but it’s not something I would get hooked on.’ Later on, in the new millennium, this traditional sushi plate at Ajisai Sushi Bar in Vancouver covered a whole bunch of trying something different. 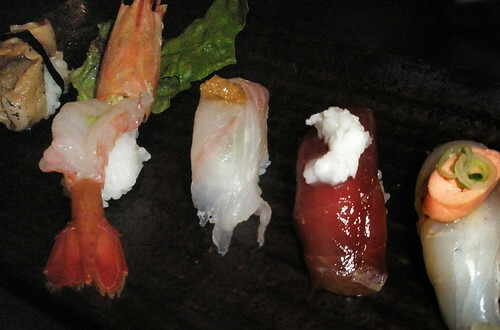 From left to right: welk conch (2nd time), sweet prawn, flounder innards (1st time), marinated red tuna and grated mountain potato, sea bream and egg. 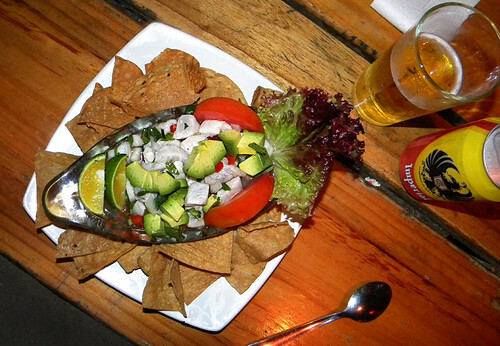 Ceviche is another way to try raw fish. This ceviche was marinated in bitter orange, and served with cilantro, tomato, avocado and lettuce with totopes on the side, in the town of La Fortuna near one of the many magnificent volcanoes in Costa Rica. More raw fish: pickled herrings are popular in most of northern Europe. 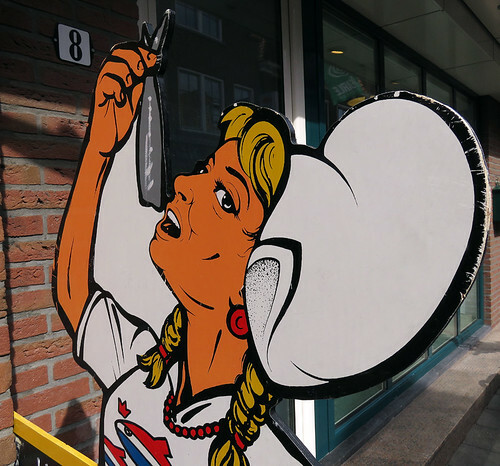 This shows you how to eat a pickled herring in Edam, Holland. 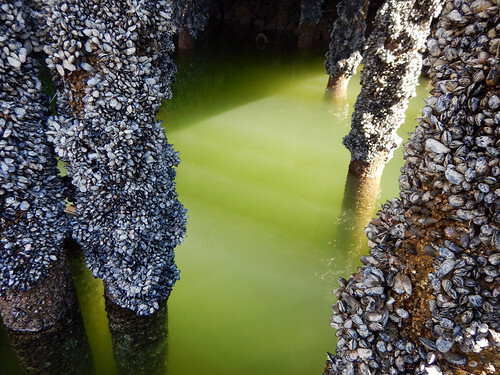 What about raw oysters? 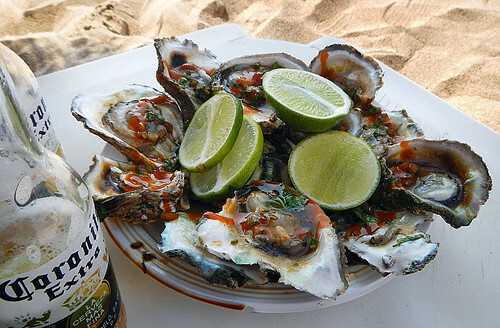 Fresh oysters on the beach off the Malecon in Puerto Vallarta, as served up by Johnny, the singing oyster vendor. To hear Johnny serve up his oysters, and hear more about his ‘secret’ sauce: www.youtube.com/watch?v=NI4dKFqurec&feature=endscreen. 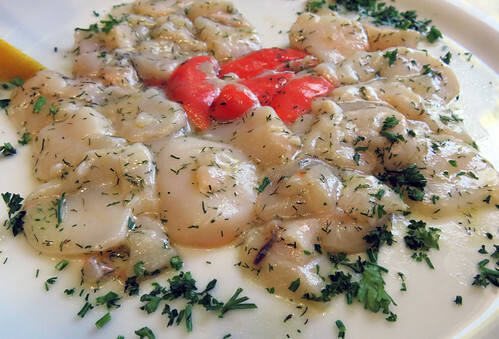 In a French village near Lens Al decided to be adventurous (when he usually is most definitely NOT) and ordered something he should probably have translated before he ordered, a ‘Carpaccio St. Jacques’. I suspect that in French Carpaccio means ‘raw’ and St. Jacques means ‘scallops’ – at any rate Al wasn’t really impressed with his first real taste of French food. 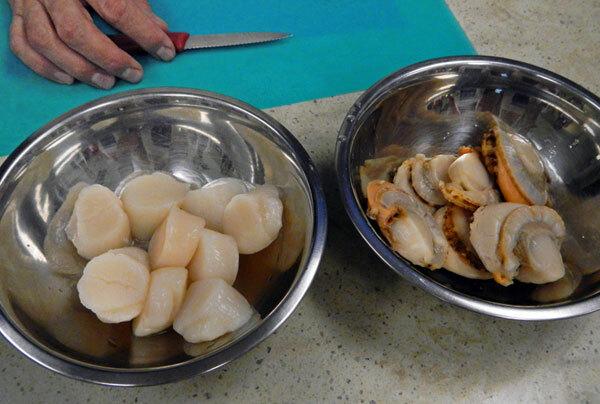 For my French Cooking Class featuring food and wine from the Loire Valley, we made up two types of scallops: the regular ones and the ones with the orangy rim that contain the roe. The Nantaise Saint-Jacques Blanquette we made from this was fantastic. 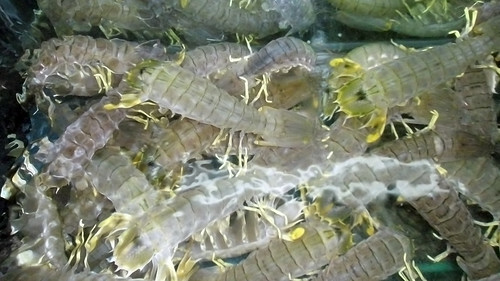 Lively sea creatures (langoustine?) in a tank eagerly waiting to be served up fresh for dinner at a restaurant on Lamma Island in Hong Kong. 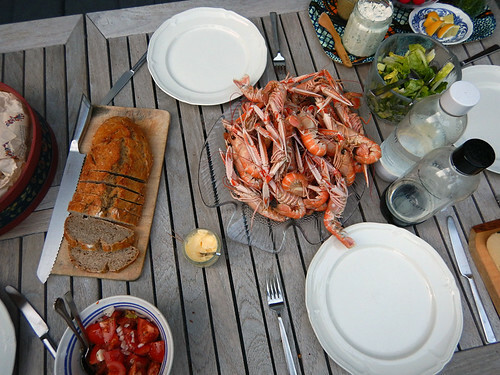 A banquet of Norway lobster (also called langoustine or scampi) in Sweden. They sort of look like the ones that in Hong Kong and I can report that they are delicious! I don’t even think of shrimp as something different but on one trip to Hawaii, back when Canadian airlines actually served amazing food, we were offered shrimp cocktail as an appetizer. Next to me were an older couple from the Prairies who had never seen such a thing and didn’t want to try it. So I ate all three shrimp cocktails! 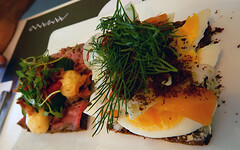 Shrimp is a favourite all over the world (except for the Canadian prairies) but it’s a regular dish in both Denmark and Sweden, usually served on rye bread. Spider crabs in the Cardiff Market, Wales. So far I’ve never met a crab I didn’t like – I think the best were the Stone Crabs in Belize! 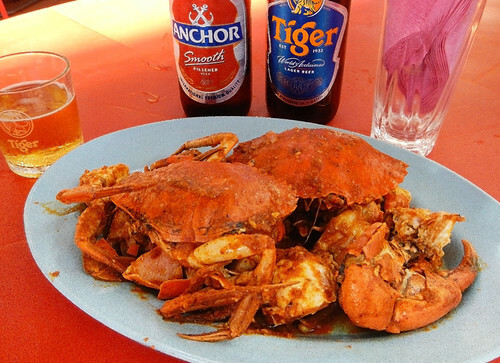 Or perhaps the Singapore Chilli Crabs in Melaka – they were too expensive in Singapore… These are Singapore lobsters – if I thought the crab was too expensive I wonder what these beasts cost? Chef Rossana tells us that this dish is usually made from unusual sweet prawns caught in the Gulf off of Veracruz in Mexico. She thought that the BC spot prawns would be a perfect substitute. (More on how to make it.) I grew up surrounded by mussels (this is a Vancouver dock) but I didn’t even know they were edible until I went to Europe in 1978. 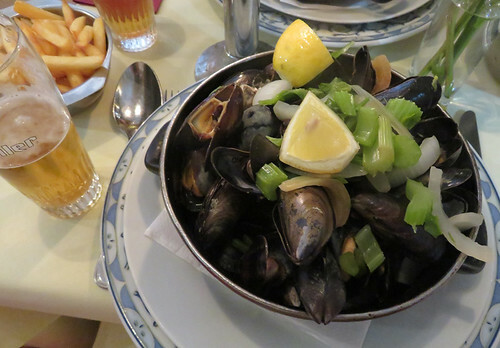 Classic mussels in white wine, celery and onion (but it should have been leeks) dish at Le Bourgeois in Brussels, Belgium. The first time I had squid was in a Greek restaurant in Vancouver – breaded deep-fried tubes served with tzaziki. 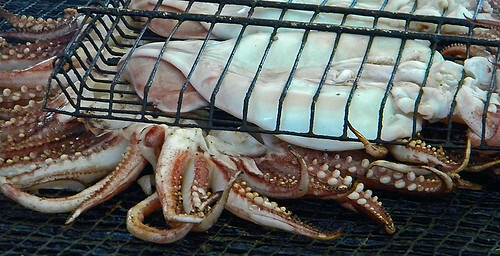 I was a lot more hesitant to eat them with their tentacles showing which is how they’re served in the rest of the world. 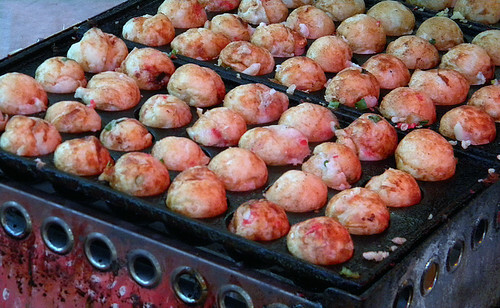 Takoyaki, doughy balls filled with octopus is a traditional Japanese food. 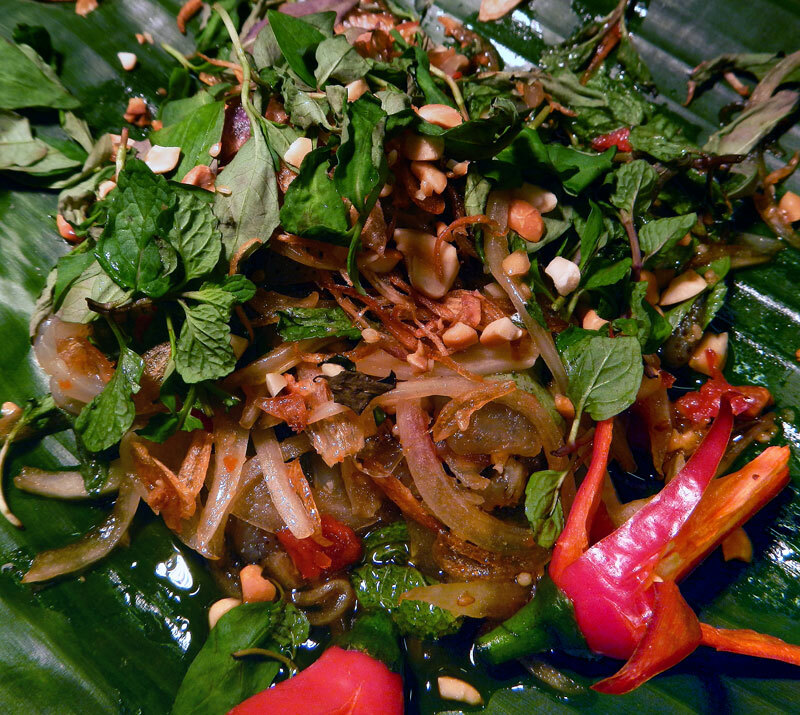 We had them in Yoyogi park in Tokyo, half-cooked unfortunately, and have never had the nerve to try them again… Jellyfish salad, one of Ms. Vy’s Weird and Wacky Vietnamese Street foods. I was curious if jellyfish was the slightly slimy unknown item that topped a piece of sushi I had eaten. But it wasn’t slimy at all; the texture reminding me of a perfect dill pickle and crunchy. I’m not sure of the flavour for the salad also contained a mass of herbs, chiles, peanuts and ingredients that made for a delicious dish, one that I would eat again. 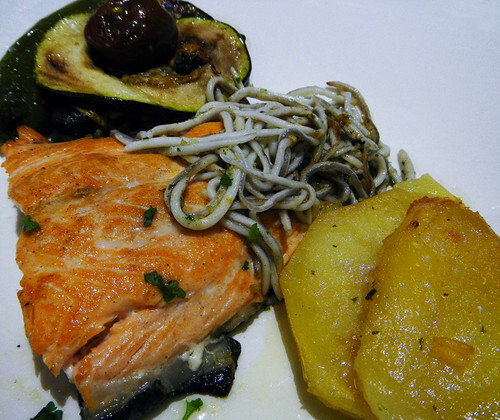 Fish for dinner with roasted eggplant, tomatoes and potatoes, garnished with gulas (baby eels) in Madrid, Spain. I thought they were mushrooms the first time I had them in a Pinxos bar in Bilbao. 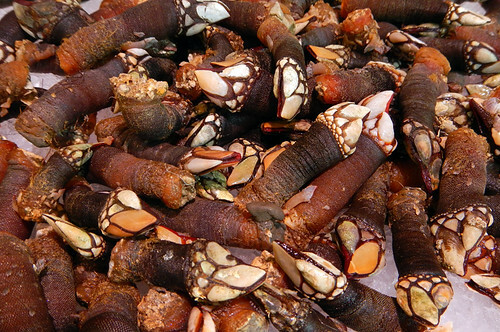 So the next time I feel like having something different I might go for these seafood treats I haven’t yet got around to trying such Gooseneck barnacles. These were in Spain but I have seen them growing on Vancouver Island where the fishery has resumed (for export to Spain) despite that fact that these babies prefer heavy surf and are dangerous to harvest. 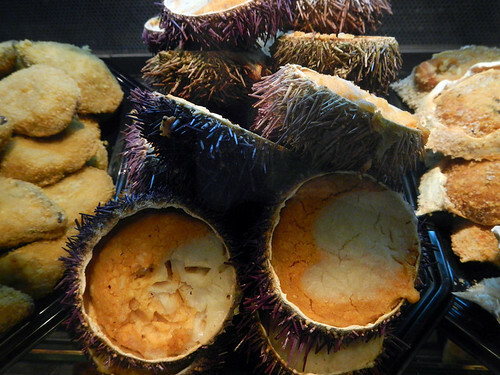 Sea urchins, also at the market in Madrid. 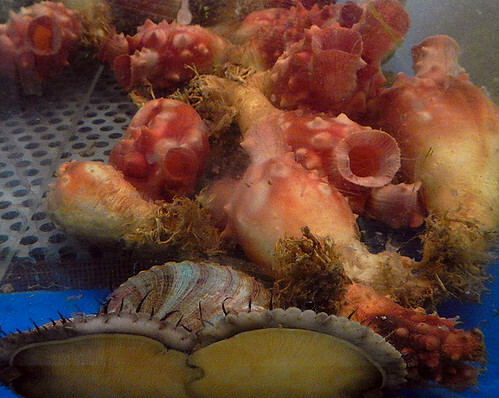 Sea squirt at the T&T, a local Asian market. Haven’t tried this yet but I’ve never met a seafood I didn’t like… Crates of live Geoducks on Vancouver Island, waiting to be loaded into a refrigerated truck, arriving in China the next day. I haven’t tried these yet! They are a type of clam and supposedly taste like clam so I need to get over my distaste of their appearance and try one! What’s the most adventurous seafood you’ve ever eaten? Checking it over I see I missed two of my favourites: shrimp and prawns – perhaps they weren’t different enough for me, but I should definitely put them in! Also two of MY favs! I’ve tried some of these and enjoyed them Always keen to try more. Years ago I hired a fisherman to take me snorkelling in Mauritius (didn’t like the hotel offering). He dived and came back with oysters for breakfast. Hard to beat! How were they prepared? Cooked or raw? I’m having a hard time imagining oysters for breakfast but I could see they might be good with a Caesar (clamato and vodka)! Fresh out of the sea with lemon juice and a dash of tabasco. It was mid morning, so a very late breakfast. That’s still the way I prefer oysters. Mmmm sea food! I have tried mostly all except the sea urchins. We made risotto with sea snails, even. The little ones were okay but the big snails I wouldn’t recommend. My favourites are all kinds of grilled fish (except the eel was not all that), all kinds of shells especially vongole and mussels (alla buzara with garlic, wine and breadcrumbs), squid (entire, stuffed or not, oven baked with potatoes, garlic and rosemary), octopus (boiled with potatoes in salad), but especially all kinds of scampi-prawns-crab-shrimps. I’m especially partial to the European spider crab. Italian make a to-die-for pasta sauce with it. 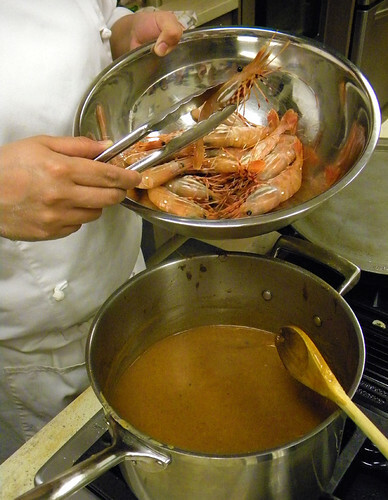 My favourite own recipe is scampi alla buzara – with carrots, garlic, wine, breadcrumbs. Interesting things in your post: I laughed at the photo of the herring-swallowing technique, wondered at how mussels could not be edible and how that raw St. Jacobs must have tasted (I’m not a fan of raw things in general, sushi I tried only a couple of times, not overly impressed), and I hope that you give octopus another chance, possibly in the Mediterranean. Wow, you’ve given me a whole bunch of new experiences to try. We have razor clams here on the Pacific West Coast which are not endangered so you have to come out here to get more of them! 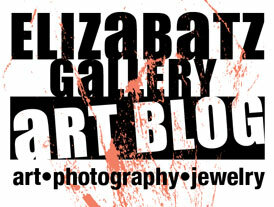 Oh – excellent entry for this challenge! Lovely shots as well. So many foods to explore (although I have to go out to Ikea to get decent Swedish seafood)!